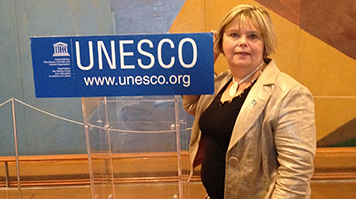 Dr Anne-Maria Brennan, Associate Professor in the School of Applied Sciences and member of the Parliamentary and Scientific Committee, helped highlight the need to protect the cultural heritage of scientific discoveries at a UNESCO conference in Paris. This is just one of a number of initiatives Dr Anne-Maria Brennan has been involved in as a member of a partner organisation in the UNESCO International Year of Light and Light Based Technologies. Dr Brennan states: “When people think of world heritage they think of the Grand Canyon, Stonehenge and St Paul's Cathedral. Yet the United Nations is committed to recognising and protecting the world’s educational and scientific heritage. “Along with safeguarding the original documents, we must ensure they are translated and both the originals and translations are scanned so they are available for researchers to use online. After all, science not communicated is science not done!